﻿ What can we expect from the future of Virtual Reality Trends for 2018? The countdown will begin soon for 2018 and lot of preparations is yet to be done in the mobile app development world. Despite rumors that Virtual Reality falls short of surpassing Augmented Reality courtesy few unavoidable reasons that work behind its slower acceptance, the value of the Global VR market is likely to reach $26.89 billion by 2022. Top mobile app development companies, around the world, struggle to harness the applications such as Augmented and Virtual ones to be the pioneers of modern technology. If we have a detailed analysis of the modern picture in education, corporate, medical units and supermarkets, we can be surprised by the number of VR headsets employed there. So, how can we undermine the strength of Virtual Reality?? Such a statement brings us to yet another question and that is what will be the future of VR in mobile technology?? Responding to this question, a predictive analysis of the future trends for Virtual Reality is indispensable. The complete experience with different sensory organs other than eyes and ears using VR gadgets to render a complete sensory immersion forming the very next stage of Virtual Reality. Examples of device conceptualized on similar grounds are the Wireless aromatizing device that fans out the unwanted odor. More advanced VR tools other than headsets will be devised to cater the lot more than giving a virtual experience to the users such as experimenting on mediums like YouTube and Instagram without taking help from an enterprise studio or owning a dedicated team. Shopping in real-time with VR will not be a surprise of 2018 rather an advanced continuation of something that has already started with Myntra, Alibaba, and few other brands. This time we can expect this segment to surpass all limits of imagination to allow buyers to try out their apparel from the comforts of their home when shopping online. Give a new meaning to advertising is something that is required to make the content more convincing to the users and can directly relate to it. Already companies such as Volvo make optimum utilization of Google Cardboard to render a virtual riding experience to the rider and we can expect to witness more related applications on this. Advanced digital socialization with social media but incorporating virtual reality technology with wearable VR technology getting applied more outside video games and movies. Example Facebook developed camera-intense 360-degree recording device named Surround 360 equipped with 14 cameras to promote user-level interactions within their own social media channel. Unity 3D game development designed for both Android as well as iOS app developers is likely to take a giant leap in the coming year and continue to innovate in order to render an incredible user experience. 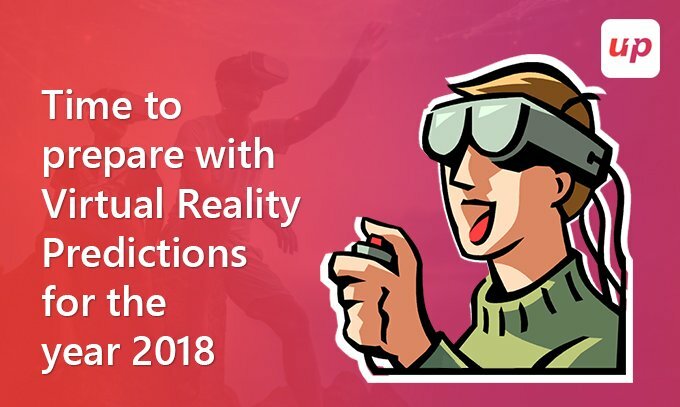 VR emoticons making way into the different applications can be one such trend expected for the New Year since emojis occupy a major space ever since mobile technology reached its peak of success and developers can think of the innovative way in representing them to the masses again. Eye tracking with VR headsets to accommodate eye to eye contact, making games and apps responsive to gamer eye movement. Also Read: Virtual and Augmented Reality in Gaming Industry is a curse or a boon? Timely future market trend analysis is always crucial to strategize prior to entering the phase so as to counter sudden challenges and continue sustaining the competition. Augmented and Virtual Reality has given a new direction for Top-rated mobile app development companies such as Fluper, who are always planning and plotting to create applications that are both innovative as well as technically updated and hence a complete of analysis of future market trends is important to brush up their in-house development skills in accordance to popular demand. So, if you wish your application to stay in the top list of the app store, consider availing the service of a dedicated mobile app developer hired to give an insight into ongoing and future market trends.